Dublin City is looking to high density bicycle parking to keep up with demand from the growing amount of commuters and shoppers taking to two wheels. The council says this is part of a plan to reach its target of a 25-30% cycling modal share by 2020. The project is funded by the National Transportation Authority (NTA). A company is being hired by the council to plan for high density bicycle parking at a number of locations in Dublin City Centre. The plan is to set up new high density parking locations and to upgrade the current free off-street cycle parking for up to 192 bicycles at Dublin City Council’s Drury Street Car Park. The review of what cycle-parking facilities are needed will also include an expansion of on-street parking and parking at rail hub locations based on ‘CyclePoint’. 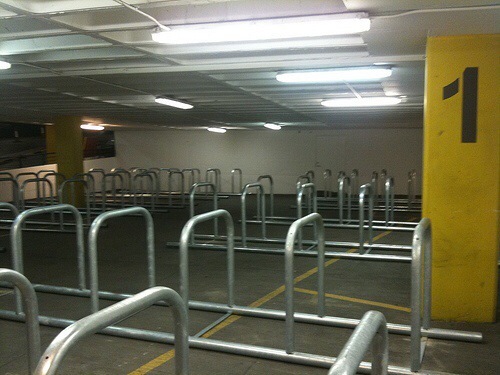 CyclePoint in Leeds is in turn based on a setup used in Dutch and other European cities which combine staffed bicycle parking, bicycle repair, rental, and retail at railway stations. Possible locations for high density parking include Trinity College, city centre lane-ways, retail quarters and tourist quarters. Firmer plans are included for Drury Street which will have a target capacity of 600 bicycles, possibly using a two-level rack in the current space, and also for Clerys Car Park on Marlborough Street where the council has planned a minimum level of 50 spaces along the existing walkway to the left of the car park exit. The plan to be developed for Clerys Car Park is to include the option to expand the facility by expanding out into the first row of car parking spaces and the development of a “car park operator managed model for mode transfer from car to bike” — where motorists park at the edge of the core city centre and cycle the last mile, as is common in some Dutch cities. Overall the company hired is to devise and recommend a strategy for the provision, management and security of cycle-parking facilities in the city centre. The project will start with the mapping and photographing of existing public bicycle parking facilities in the city council’s area, which is mostly made up of on-street stands. This will be closely followed by an assessment of demand in the city centre area within the canals, plus 400m outside the perimeter of the canals. The demand study will also include the centres of Ballsbridge, Ranelagh, and Rathmines — the three of which have higher levels of cycling than northside or western urban villages outside the canals. The level of demand is to be assessed by looking at current cycling statistics and trends, current and planned transportation infrastructure, demographics, modal shift trends and targets, and any other available relevant information or reports. The project will also look at signage directing people to bicycle parking and the potential for real time “Cycle Parking Spaces Available” electronic signs. Under the current tender, designs will be developed for the Drury Street Car Park and the Clerys Car Park, one other location which has yet to be chosen will be designed and brought to contract stage, and the preparation work will be done on two other locations, one of these is to be a lane way location. Looking good,it looks like we are beginning to adopt the Dutch way of doing things. Although I do not like the idea of putting Cycle Parking in Laneways that are remote from people. The Princes Street area is a bit suss especially at night time beside the GPO. There is a crying need for Cycle Parking along O’Connell Street which they have now taking away the little bit there was due to Works being carried out there. You do not need expensive surveys to find out where the Parking is needed,all you need is for all these so called experts to get out of their Cars and go around the City on Bicycles. Any where there are Shops and Restaurants and Cinemas and also Apartments they will need Bicycle parking.It is a pity they have not concentrated on providing proper safe Cycling infrastructure so that Children and insecure people can ride safely without the threat of speeding Motorists encroaching on them,this needs to be provided first. I wonder if the Council could get hold of the car park under the Central Bank when they move out and turn it into a high capacity bike park? would be ideal. One thing they need to look at to make cycling more successful is to have secure parking outside the city to suit people getting a bus/train to an outer stop and cycling the rest of the journey to avoid innear city traffic jambs. (Dublin bikes help and work of a similar principal) I would geet a bus to 5-8k outside the city collect my bike from a store and cycle the remainder, this is similar to the dutch model.